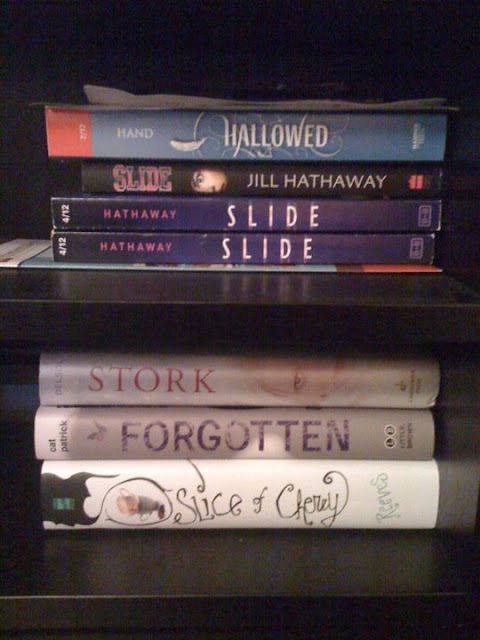 Bookshelf Tour by Jill Hathaway! So. You wanna see my bookshelves. The idea makes me cringe slightly because bookshelves are kind of personal. Not only can you tell the type of books a person is drawn to, but you can also see their disorganization and tendency to lose things. 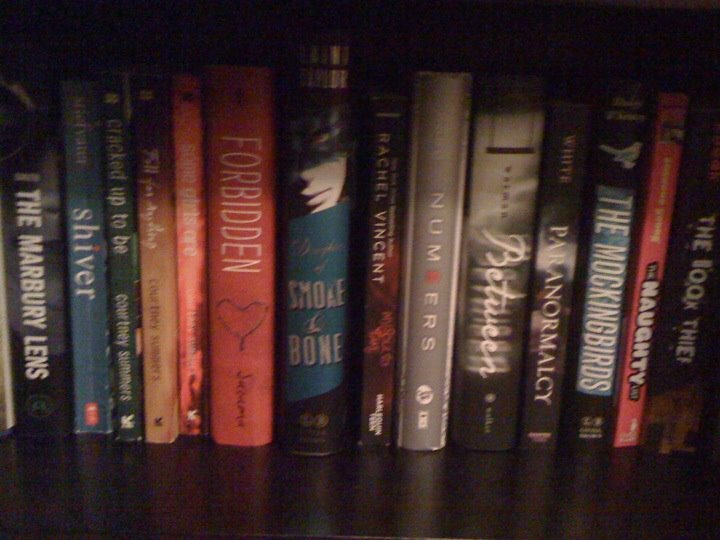 Or, at least, that's what I see when I look at my bookshelves. Well, let's see what we have here. The shelf on my desk. 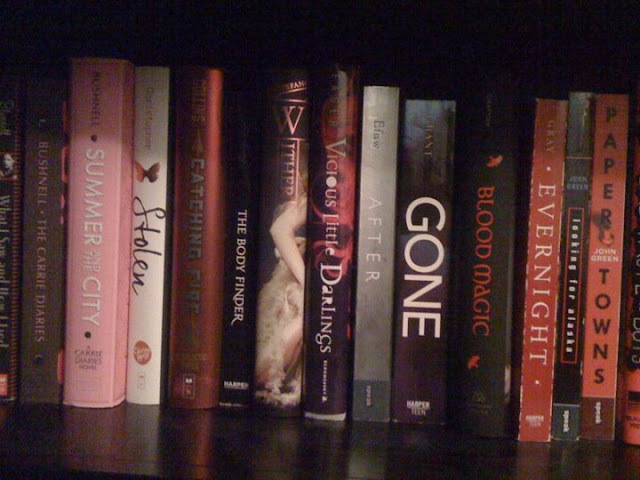 You can see that I have a couple of ARCs of SLIDE that I'm holding on for giveaways when it comes closer to March. There's also a UK ARC of SLIDE, which I'll keep forever because it's just so cool. And an ARC of HALLOWED by Cynthia Hand, which I finished last week and is simply AMAZING and I have big plans for. Below those, you can see a few of the books I'm planning on reading soon. I need to read Wendy Delsol's STORK here in the next few weeks because I'm going to the launch party for its sequel on October 18. And I picked up Cat Patrick's FORGOTTEN and Dia Reeves's SLICE OF CHERRY recently and can't wait to read those. These are my writing books. I used the Noah Lukeman ones a lot before I got an agent or a book deal. They really helped me to hone my work to the point of getting noticed. HOOKED was useful for that, too. 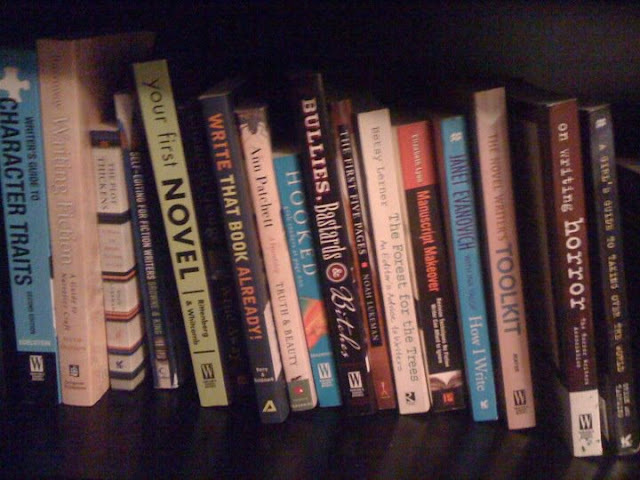 Now I spend more time reading the craft books, like THE WRITER'S GUIDE TO CHARACTER TRAITS, WRITING FICTION, and SELF-EDITING FOR FICTION WRITERS. My favorites (I have to read them once a year) include THE FOREST FOR THE TREES by Betsy Lerner and ON WRITING by Stephen King, which doesn't seem to be pictured here. It's probably lurking underneath my bed or something. Just waiting to pounce. You can't see it well in this light, but that gigantic book is THE UNBECOMING OF MARA DYER, which I finished yesterday and adored. Jennifer Hubbard's THE SECRET YEAR with its GORGEOUS cover. Mandy Hubbard's fun PRADA AND PREJUDICE. Fellow B+Ber's THE EVERAFTER. Mary Karr's XVI, again with the gorgeous cover. I was definitely into dystopian last year. I think this year I'm more into creepy/scary books. THE IVY was a fun one. Still need to pick up the second in the series. I just got back Sarah Maclean's THE SEASON from my sister-in-law and need to read it. Loved THE UNIDENTIFIED. I remember, after doing a book talk at school, one kid was like, "Where do these authors come up with these ideas???" It made me smile. JELLICOE ROAD, which I heard was amazing and am ashamed to say I haven't read yet. 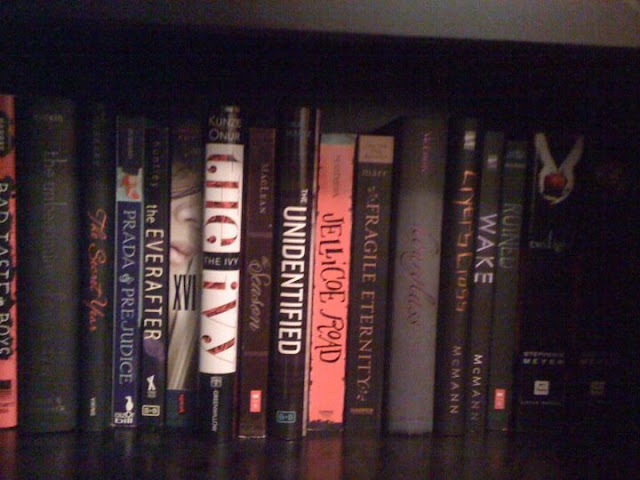 One of the many Melissa Marr books I own that hasn't been stolen by my students yet. (Seriously, I was so mad the year my hardcover of WICKED LOVELY went missing. I'm still sort of miffed about it.) HOURGLASS, which I devoured this summer and seems to be missing its beautiful dust jacket. Some Lisa McMann... LOVE. Um, I know FADE is in my kitchen right now. Not sure about the other one. And then, of course, some Stephenie Meyer. :D My husband, of all people, borrowed some of that series to take to school. Sarah Mlynowski is amazing. I had to pick up 10 THINGS WE DID after loving GIMME A CALL so much last year. 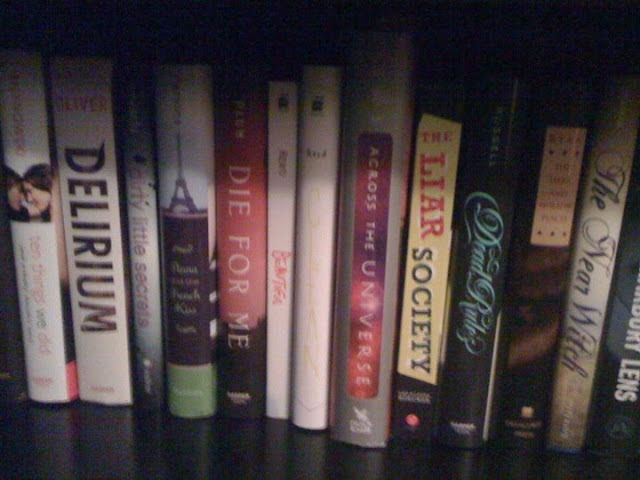 Oh, and Lauren Oliver's DELIRIUM. I have BEFORE I FALL on my Nook and so wish I had a hard copy for my shelf. DIRTY LITTLE SECRET, which I bought after becoming slightly obsessed with the show HOARDERS. And, aaaaah, Anna. Need to go pick up Lola pretty soon. I haven't actually read DIE FOR ME yet, but it has a cover to die for, so I had to own it. Amy Reed, who writes awesome, dark contemporary. I'm sure everyone knows ACROSS THE UNIVERSE. Can't wait for the next one. And, of course, THE LIAR SOCIETY. I have a TLS arc and an actual copy, and my kids are always reading these. Randy Russell's DEAD RULES, again with an awesome cover, but I need to read! There aren't enough hours in the day. The last book in Carrie Ryan's zombie trilogy. Not sure where the other two went. Yay, THE NEAR WITCH. Gobbled that up in one night. And, oh, THE MARBURY LENS. Creepy, unputdownable, essential. The first book in the SHIVER series. I think the other two are checked out right now. And all my Courtney Summers. Can I just say I worship Courtney Summers? Her books are amazing, and they keep getting better. FORBIDDEN, which I kept hearing people tweeting about and had to buy. DAUGHTER OF SMOKE AND BONE. If you haven't read it yet, do yourself a favor and DO. Rachel Vincent's MY SOUL TO TAKE. The rest of the series is floating around my classroom somewhere. Rachel Ward's NUMBERS, awesome concept. Jessica Warman's BETWEEN, which Megan Miranda made me buy. She knows me so well. Great mystery. Kirsten White's adorable, kickbutt PARANORMALCY. Still need to pick up the second one. THE MOCKINGBIRDS, which I still need to read. THE NAUGHTY LIST, my daughter's favorite series. She likes to carry them around my house. They're so PRETTY. Somewhere I have Suzanne Young's A NEED SO BEAUTIFUL, and I'm desperately awaiting A WANT SO WICKED. Dude. She's a genius when it comes to titles. I still need to read THE MOCKINGBIRDS. I teach THE BOOK THIEF to my seniors, and they love it. Anyway, thank you so much for having me, Amanda! I had a blast!